If you own an old upright piano, every few years, you ought to open up the base of the piano and take a look. Often times you will find rodent nests, broken pieces of the piano action, decades worth of dust and old pencils, or anything else you can imagine. This process only takes a few minutes and can give great insight about any ailments that may be affecting your piano. 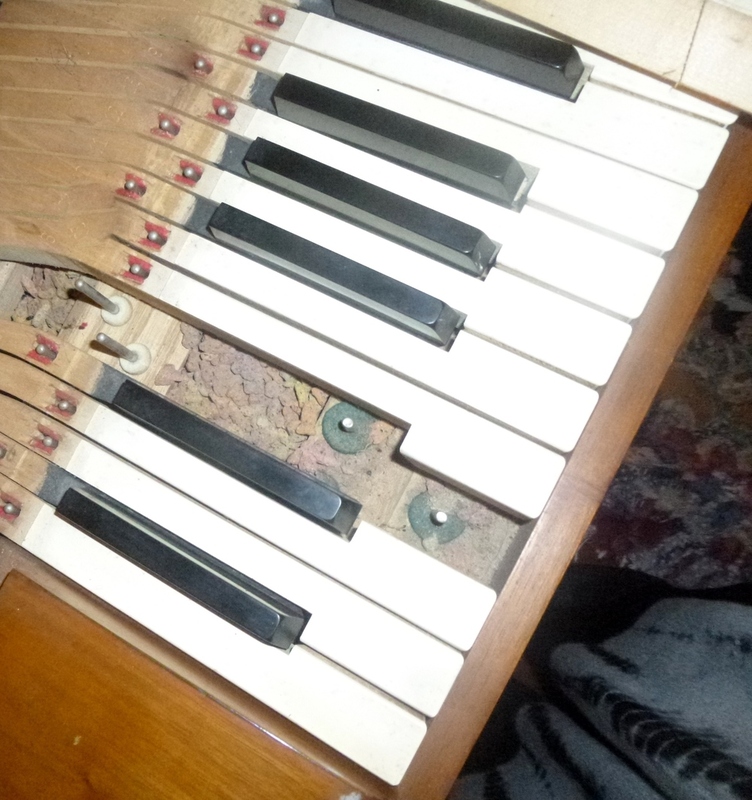 I was recently called out to diagnose an old spinet that had survived Hurricane Katrina. The water had risen a few inches above the floor of the house and the water line could still be clearly seen at the lower end of the cast iron plate inside the piano. The reason I was called in was because, in addition to the piano being out of tune, many of the keys were either sticking or just moving very roughly. The first thing I did when arriving at the owner's home was to remove the lower panel of the piano (looking for a clue as to the piano's history). I saw the water line on the plate, but I also saw what looked like small piles of cat food along the bottom board inside of the piano. To me, this immediately implied a past or present rodent infestation. At some point, these critters had made this piano their home, found an open bag of cat food, and had stashed some of it for later. This definitely gave me an inkling as to what was going on with the keyboard. There is usually large enough gaps in the keyframe under the keys for mice to squeeze through and move around underneath the keyboard. However, this inkling didn't fully prepare me for what was to come. After my quick check inside the lower cavity of the piano, I decided to pull a few keys out of the piano to see if there was anything underneath that could be jamming them, as well as looking at the condition of the bushings inside the keys that usually allow it to move smoothly up and down. After removing the top panel and fallboard, I lifted a few keys off the keyframe. What I found was that during the storm the mice that had been storing their food in the bottom of the piano needed to look for higher ground and, finding the cavity underneath the keys, had completely packed it with partially chewed cat food. The entire length of the keyframe had served as their emergency food storage. The food was so tightly packed and stuck together that it had to be chiseled out with a spoon and screwdriver. The piano's owner and I spent a little over an hour removing all of the keys (and numbering them to ensure they were replaced in the proper order), scraping, scooping, brushing, and vacuuming all of the cat food out of the keybed cavities, and replacing the keys. Once the keys were back in, I was able to play all the way up and down the keyboard with only two keys showing any signs of sluggishness. These were quickly remedied by slightly easing (compressing) the balance rail bushings inside the offending keys. This piano provides a great lesson about being vigilant about maintaning your piano. Open up the lid and the bottom panel every once in a while and take a look inside. If you see broken wooden parts, missing screws, or piles of small debris formed by rodents, you should take action quickly to prevent any small problems from becoming a serious issue that will prevent your piano from having to undergo expensive repairs. If you find that there are rodents moving in and out of your piano, be careful when cleaning up the mess they leave behind. Rodent feces can contain harmful viruses, so you should wear a dust mask and gloves. If you think they have caused damage to your piano, call your local piano technician to perform repairs and advise you on how to prevent similar damage in the future.